A prolific writer with an expansive range, Henry James traced his Victorian gentility and class-consciousness from his upbringing in mid-19th century Greenwich Village. Though he later made England his home, the memory of his early life in Manhattan would reflect in his writing throughout his life. Spending his childhood on Washington Place, in the refined and sophisticated Greenwich Village, he would write a novel a few years after moving to London entitled Washington Square in 1881. Though Henry James is one of the few Americans memorialized in the Poet’s Corner of Westminster Abbey in England, Greenwich Village’s impact on him and his literature was indelible. Henry James was born on April 15, 1843 to a wealthy family at 21 Washington Place. His family’s affluence was due to his paternal grandfather’s sizeable fortune, which had been split among his children, including James’ father, Henry James Senior. It was this windfall that allowed Henry James Sr. to pursue an intellectual career and he wrote and lectured on a variety of theological matters. His mother, Mary Robertson Walsh James, was from a wealthy upstate family and was a devoted wife and mother to five children. His family led a very cosmopolitan lifestyle, traveling quite a bit to the fashionable cities of Europe. As a result the James children received very erratic educations and Henry Jr. was notable for disliking his formal schooling. He was however a voracious reader. His father wrote of him, “He is a devourer of libraries.” At 19 he briefly attended Harvard University to study law, but left before graduating to pursue a life of letters. He published his first short story, A Tragedy of Error, at 21 and spent the following years contributing to The Nation and Atlantic Monthly. A lifelong Anglophile, Henry James Jr. moved to England in 1876, and would write a number of novels and short stories about Americans living abroad, such as The Ambassadors and The Portrait of a Lady. 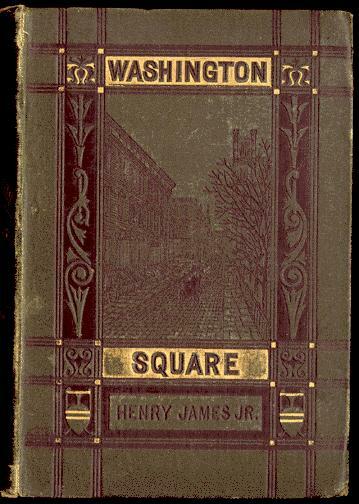 However, in 1881, Henry James published Washington Square, a short novel that presented the fashionable, affluent, 1840s Greenwich Village as a complex microcosm where money was the foremost motivator. Like many of James’ works, it is a novel of manners, but unique to this book is the focus on familial relations. Much of his oeuvre would focus on characters exploring the world outside their home but many scholars have compared this novel to Jane Austen in its narrow view, concentrating on a single family in an exclusive neighborhood. The novel focuses on the wealthy Sloper family, the father Austin, the daughter Catherine, and the aunt Lavinia, who live on Washington Square in the 1840s. Catherine is plain and dull but very kindhearted and while her aunt and father love her, throughout the novel monetary motivations affect their treatment of her. A handsome and charming grifter, Morris Townsend, enters the picture and upon learning of Catherine’s future inheritance proposes marriage. Her father, demanding obedience from the women in his home and hoping to protect his fortune, orders the engagement to be broken and Aunt Lavinia recognizes Catherine’s precarious position but also sees an opportunity for her own inheritance to be increased dramatically if her niece were to be disinherited. The world that James portrays is the one in which he grew up. During the 1840s and 1850s, Greenwich Village was the neighborhood for New York City’s elite. It was comfortable, it was elegant, but it was also a rigid society held fast in the grip of social hierarchy and Victorian ideals. But while the novel takes a complicated look at the problems with society in the 19th century, James would look back fondly at the Greenwich Village he knew as a young man. He would return to visit the United States in 1904 and upon realizing that 21 Washington Place had been torn down he stated that his birthplace had been, “ruthlessly suppressed.” Walking around the Greenwich Village of the early 20th century, which was much less gentile and much more modern than he remembered, James found the new construction crude, impersonal, and “having been amputated of half of my history”. I remember reading Washington Square my freshman year of college! At the time, I found James witty and entertaining. Reading your post, I realize that the context in which he wrote the novel — as an emigre to England — makes it more than a work of fiction. It seems also to be a study of memory and identity formation for the author. I wonder what he would think of Washington Square’s modernization today! I read Washington Square over the summer and really enjoyed it. I like the observation you made about the novel being similar to Jane Austen novels in that the narrative is focused on the lives of a single family with little attention given to the larger world outside of their insulated community. It’s interesting that James was far removed from the setting of his novel during the course of writing it- almost as if he felt the need to be isolated himself in order to give the environment of the novel the right atmosphere of exclusivity and seclusion.